Estimated reading time: 1.6 min. And the race in on, with Web Directions South 2008 a major Australian web event for 2008 looming ever closer on 23-26 September 2008. 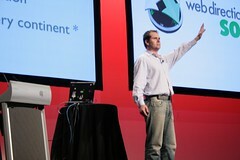 Web Directions is not like any run of the mill luke warm web conference. For me it’s like the meeting of the tribes. You get Information Architects, Usability Consultants, Front End Developers, Project Managers and Back End Developers all in the same place, at the same time, talking the same issues, shoulder to shoulder, noobs next to seasoned professionals, it’s like a great big melting pot of ideas. Okay I’m a little bias, having been to WDS 2006, WDS 2007, and WDUX08. Sure the program is overflowing with talented speakers that will change the way you look at the web. People like Douglas Crockford, Jina Bolton, Derek Featherstone, Jeffrey Veen, Jeff Croft, Mark Pesce, Myles Eftos, Dmitry Baranovskiy, Kay Smoljak, Laurel Papworth and many more. These are the cream of the local and international talent. A few of these speakers I have seen before, some are new (to me) others are good friends. Still they are all worth me hauling myself from Perth to Sydney for this yearly pilgrimage. But it’s more than that, Web Directions is really about the people. The attendees. You and me. They really make this conference, it’s to be honest like a week long (almost) intense web festival of ideas. I remember last year the conversations of new ideas over a breakfast of coffee and a massive plate of scrambled eggs at the Concrete Cafe to the rapid fire discussion at the closing party. Web Directions South is not about a conference that just stops at the sessions, it spills over into the everyday into the evenings to the point that people talk about it for weeks, even months later. I’ve said it before, but this is THE east coast Web conference to attend. There Maxine, do I get my Iphone now?